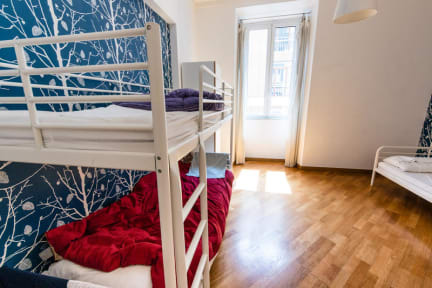 Ein kleines, gemütliches Hostel mit nettem Personal, modern eingerichtet und die Lage ist top. Wir konnten so ziemlich alles zu Fuß erreichen, mit unter auch schneller als mit div. Verkehrsmitteln. Sehr empfehlenswert. The hostel was very nice and modern. It was absolutely clean and air-conditioned, which was perfect due to the heat outside. The hostel itself was in a quiet sidestreet. We've had a good breakfast with fresh milk and juice each day. The room was cleaned every day, so it felt more like a hotel than a hostel. We only met Alessandro during the days. He helped us a lot and replied always quickly when we had questions about something. Thank you very much for this nice stay! Angenehmes Hotel in ruhiger jedoch guter Lage. 10 Minuten Fußweg zu den großen Sehenswürdigkeiten. Sehr gut ausgestattete Küche, sehr hilfsbereites und nettes Personal, gute Zimmer. Hier jedoch die Matratzen ein wenig durchgelegen, ansonsten aber ein sehr empfehlenswertes Hostel. The hostel is located in a side street in an apartment build near the american embassy. You can walk to Fontana di Trevi in about 10 to 15 min. Our room (3-bed mixed) was huge, the ensuite bathroom was clean and also quite big. Beds were comfy, tho blankets were too thin for sleeping with an open window (at least in November). The staff is very friendly and professional. Breakfast was ok, the instant coffee was challenging tho. All in all a great stay, full recommendation. Staying at the Hostel so close to everything in Rome was pretty amazing. Almost no need for puclib transportation and the location felt very safe. The breakfast was good, for sure not the best but good for the value of money and was fine to start the day with. The staff was very friendly and helpful, the atmosphere not that much like a hostel due to the separation into two stories and separate common area. That made it quite hard to get to know fellow travelers. I stayed in a private room and it felt like a hotel, in a good way. Staff were super lovely and we had unlimited access to snacks and a bottle of juice daily. Definitely recommend and would stay again. Location was easy find and to get around. Although probably not the place if you were looking to meet people. Nice hostel, small, very clean. Perfect, if you want to explore the city and have a nice place to sleep. Eine Spiegel und eine Garderobe im Zimmer wäre schön.